You probably know by now that my dog, Ella, has a thing about being covered up. She's half Chinese Crested, so she has no undercoat, and not much hair at all on her chest and belly. She likes to stay warm. In fact, that's an understatement. She's a canine heat-seeking missile. 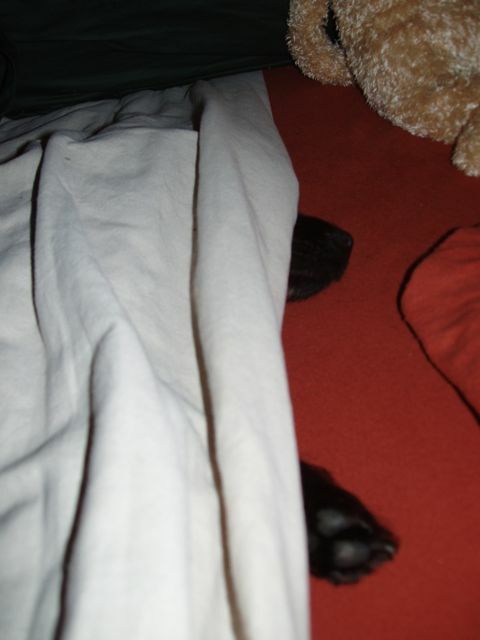 I once thought that either she was unusual in this, or that most people wouldn't let their dog under the covers even if the dog wanted to be there. Here's what I learned in the course of gathering puppy and kitty photos for this blog meme. And I had to include this sweet photo of Susan Walters' wonderful dog Maggie, even though I wasn't able to get in touch with Susan in time to get any thoughts about Maggie in her words. But she's told me on many occasions how much she loves Maggie, and when she sent this photo, she simply said, "Here is my little love, Maggie! I can't sleep without her beside me!" And I guess that says it all. "Boo is my best buddy. He loves to sleep under the covers and cuddle with me. Every night, he'll either sleep next to my side on a pillow or he'll sleep near my head. He also loves to play and hide in the covers. Every morning, before I leave for work, Boo hides on my bed. Either he will hide under the covers (with his tail sticking out, of course) or he will attempt to hide behind a pillow. His ears will be flat and his eyes will be black as night. I know he is ready to play. I put both of my hands up in the air like claws and act like I'm going to "get him" and he'll get so excited. He bounces all around the bed like a frog and then he will bury himself under the covers and wait for me to get him. We do this every morning. I think I may look forward to it more than he does!" "Oliver is my sweet, shy baby. It took him a long time to feel confident enough to jump up on the bed. Often, he would watch with amazement as Boo jumped up but he would always just hang out on the sidelines. One day, he decided to imitate his "older brother" and up he came! Once he started regularly jumping on the bed, he would play for a few minutes or just briefly sleep next to my leg. He never stayed too long. That is, until The Blanket came along. Not too long ago, I bought this big, super-soft blanket for my bed. When Ollie stepped on it, he immediately started running his feet up and down on it - or in cat lingo - "kneading". He kneads and purrs and puts his face close to the blanket. (He even drools sometimes!) He often does this until he falls asleep. It is so adorable. And, as you can see in the picture, he often curls up and creates an almost igloo-like spot for himself!" So much for thinking Ella and I are the only ones. As promised, a note from Trish Jordan and Tucker regarding Pitbulls. "I honestly have No Idea how anyone could be scared of this baby, when I look at him, all I see is his sweet smile. He loves me absolutely and completely, he loves his cat and his boy, what else could anyone want? And to those of you that haven't taken the time or had the inclination to actually get to know a Pitbull~ Remember, these are Very Smart Animals. They KNOW when they are being discriminated against, and I can't speak for any of the others... but it hurts Tucker's feelings horribly. When someone says something horrible at him when we pass by, and he didn't even DO anything, he always has to stop, bury his face in my knees, and insists on holding my hand until he feels better, so we are usually stuck there for about 20 minutes. Paying it forward isn't just for people." A good reminder to all of us that prejudice is prejudice, even when it's aimed at a dog. We can do better. Here's a follow-up, appropriate to the segue from puppies to kitties. This is Mika, who belongs to my UK friend, reader and blogger Nikki-ann. Her kitties will have a dedicated More Kitty post in the coming weeks, but meanwhile Mika seals his credentials as an Undercover Pet.